We've been getting Alex used to running errands with us over the last year and so today, when I needed to pick up some unexpected school supplies, I didn't think too hard about going with Alex. The first few stops inside Walmart went well but when I stopped to pick up more sweat pants (since many of Alex's have become more sweat capris than pants), disaster struck. He pulled a pair of pants off the shelf and threw them on the floor. I bent down to pick them up and when I straightened up, Alex was gone. At first I didn't panic. I thought he must have gone to the baby display, which is a favourite area of his and right next to the boys' clothes department. I searched the aisles, calling his name. Now I'm starting to worry. I have no idea which direction he's gone and I can't think of any other area in the store which might have attracted him. Pride vanished and I went to customer service to let them know I'd lost my child. They responded very promptly and luckily someone had seen Alex running out of the store to look at the vending machines outside the doors. I retrieved him, thanked everyone and grimly finished my shopping one-handed. This incident demonstrates with terrifying implications just how quickly Alex can vanish. He is socially aware enough to realize when an opportunity presents itself without having enough social awareness to pick up on the potential dangers or consequences. Immediate consequences: no cheese bagel at Tim Horton's and having to hold Mommy's hand throughout the rest of the errant (which he hates with a passion). Long term consequences: fewer errands or other opportunities to go out. He's destroyed about six months of accumulated trust this afternoon and it won't be easily rebuilt. This is one of the gut-wrenching parts of parenting. I have to give Alex opportunities to grow and learn but that means that sometimes I will have to accept adrenaline-pumping failures as a possibility. I'm glad and relieved things turned out okay. I'm also relieved to know that Alex is registered with the autism registry with the police. If he had simply wandered off (in search of a park or some other obscure destination), the police already have his description, photograph and brief outlines of how to approach him. This could very easily have turned into a parental nightmare. I believe I've taken all reasonable precautions to prevent disaster but that doesn't change the fact that I'm still running an adrenaline high. We had a successful dump in the toilet from our younger son. We've been working on this for a long time now and this is the first time he's relaxed enough to actually go on the toilet. I know better than to assume we're out of the woods. There will be lots of back and forthing before it becomes an established skill. Today was our last day in our summer therapeutic riding program and unfortunately for Alex, it did not end on a positive note. Although initially eager, as soon as he got on the horse, he began to whine and complain. When that didn't bring the desired results, he began to kick at the horse and throw away any toy or tool his volunteers brought him. Finally he began throwing the reins over the horse's head as it was walking, risking a major tripping incident. The volunteers decided to cut the lesson short (a decision I agree with and probably would have done sooner than they did). He was quite upset at being denied his usual post-ride cheese bagel but I've always told him that was a reward for cooperation. He ended up sitting with me while Nathan finished his riding lesson. Aside from today, the lessons have gone quite well. Alex has learned to use the reins and adapt to a saddle. He sits well and has no fear of the horse. He usually enjoys the lessons and I see him recreating them with toys horses and Playmobil figures. I've been trying to decide what went wrong today. Is he stressed with the upcoming routine shift to school? Is something physically bothering him (he's been fiddling a lot with one of his teeth although it doesn't seem to be loose)? Was this just an exercise in defiance and non-compliance? Is he becoming ill? It's hard to tell. I likely won't know for days or weeks after the fact. I think I did the right thing in sticking to my parenting guns on the cheese bagel. Regardless of what is going on, throwing tantrums is not a socially acceptable way to express displeasure. He does have the words to express himself (not easily but the capacity is there). He's been even more irritable through the day at home. Having to watch Nathan get his reward for compliance was difficult for him (although I hope it helps to drive home the message). It seemed that every time I turned my back or tried to get something done, Alex was getting into something he shouldn't, pushing his brother or having a toileting accident (8 changes of clothes and counting). Days like this are frustrating. Aside from the stress on me of having to deal with crisis after crisis, I have to try and play Dr. House to find a differential diagnosis with minimal symptoms. And unfortunately, no writer is sorting the symptoms for me to make sure I only have the relevant ones. It's days like this where I have to remind myself that he is not actively trying to drive me crazy. That he is probably just as upset and frustrated as I am in trying to communicate. Empathy is an active process but it keeps me from losing my temper inappropriately. 6 days and counting until school starts. As an antidote to nervous energy, I spent more time this weekend working on the dollhouse reconstruction. I made replacement panels for the missing molded plastic. Here's one of the originals. And here are my attempts at replacements. I used thick watercolour paper and toothpicks. Next I had to try and make them match in colour. It took a couple of tries but I think I got a good match. Then I went ahead and retiled the side porch roof. It had come off years ago so I could bring it upstairs to work. First I cut a solid piece of bristolboard that exactly matched the roof, then I glued my tile strips onto the bristolboard. And glued it all together. I think it turned out pretty nicely. Let's all hear it for funneling nervous energy into procrastination creative projects! All this in only one Babylon 5 episode. Tomorrow the staff come back to prepare for the upcoming school year. Which means: tomorrow my annual battle with the school board begins anew. To be fair, it hasn't exactly been a World War II or Napoleonic level of conflict. The boys' schools have been good about communicating and been open to me and my suggestions. The challenge has been in follow-through. For example, in the summer between junior and senior kindergarten, there was a rather simple plan set up in June. Nathan would share an EA as needed with another child with plans to phase out the EA by October once a routine had been established. Nathan would have a visual schedule and regular visits to a quiet room to help him maintain equilibrium. I agreed that Nathan didn't need to meet the teacher or see the classroom in advance. He'd done very well in JK and I didn't anticipate any trouble with SK. Of course, when I spoke with the teacher in mid-September, I got a very troubling report. Nathan was having a lot of trouble and acting out in class a lot. I was concerned and got right into crisis-management mode, brought out social stories at home and set up regular meetings with the teacher. It wasn't until the beginning of October that I discovered Nathan had been receiving no support. No visual schedule, no prompts from the EA. Nothing. I don't want to go through another difficult transition. The school was quick to remedy the situation but the damage had been done. So tomorrow, I make sure the plan we all agreed to back in June will in fact be implemented at the beginning of September. It's tiring. I should be focused on having the right size shoes, the right school supplies or cool backpacks for the boys. Instead, I get this one additional concern which has the potential to cascade into an annual fall crisis. The boys won't be able to tell me if things haven't been set up properly, depriving me of the traditional spies parents use. I hope things go smoothly. But I've learned not to count on them. Alex has a lot of oral sensitivities. This has made transitioning to solid food a nightmare ever since he was a toddler. If it wasn't pureed, he rejected it faster than if we'd have fed him live bugs without a Fear Factor camera crew. But we have persisted and made small gains. Three and a half years of gradually increasing chunkiness of our homemade purees to get from Jell-O smooth to chunky relish. Recently he's been doing much better with trying solid food like pizza, peanut butter sandwiches and muffins. However, we have still been buying baby food for almost a decade. And last week, someone at the grocery store let on that she'd noticed that. Dave was going through the cash when the cashier (a regular) asked him how many kids he had. Dave looked up in surprise and asked why. Cashier: I noticed you've been buying baby food for a long time so I figure you must have a ton of kids. Dave then had the moment of decision. Does he admit that he's buying baby food for a nine year old? Does he explain autism and food sensitivities? Does he risk getting the lovely patented 'you're a bad parent' glare? Or does he pretend to a Mormon-esque level of fertility? Oh yeah, the wife is constantly poppin' 'em out. Got us a converted school bus minivan. We only have dessert on weekends at our house. Usually something small like a cookie. Nathan usually finishes his meal before us and is allowed to play until we finish. However, our meal is interrupted constantly with requests to know "are we done yet?" and pleas for his cookie. I've spoken to Nathan several times in the past about how it is rude to keep pestering someone, even when you're super excited about what's coming. But it hasn't sunk in yet. Nathan: Are you all done? Me: (trying to maintain a mask of teaching moment serenity over mild irritation) Nathan, remember how we talked about this? Me: About how it isn't nice to keep asking people if they're done. It hurts their feelings because it's rude. Nathan: (visibly taken aback) Oh. I'm sorry, Mommy. I don't want to hurt feelings. Nathan: Are you all done now? This is where I lost my parenting high ground by laughing hard enough to bring tears to my eyes. Somethings are teachable and some are not. Patience to a six year old where cookies are involved may be a not. When I first heard about this, I hoped people were exaggerating. But they're not. The letter sent to the family about their child with autism was hateful. If you want to see the text, you can look here. Reading it, I am struck by the fear and disgust of the author, which can be a very dangerous combination. The community is rallying around the child, which is good but this still needs to be taken very seriously as a threat, which I hope the police are doing. I've written about this before. It's an unfortunate fact that children and adults with autism tend to be targeted more by disgruntled individuals simply because they stand out from the crowd. A brief snap of temper can result in a violent outburst and while people are often contrite once their temper has mended, it doesn't change the fact that the person with autism has had to deal with that outburst and many like it. One thing I urge parents to do is to think about how they want to handle such confrontations. Often they will be face to face rather than through a letter and so some handy retorts can be useful. My default position is that I will apologize for misbehaviour and inconvenience, I will explain odd but not harmful behaviour and I will crack down on any aggressive behaviour. But if I will not allow my child to be subject to emotional or physical abuse. I don't care if it costs me a teaching moment. Whether it's someone making a snide comment because my child touches his car or someone attempting to physically manhandle my child, it's not going to happen on my watch. I expect proper behaviour out of adults, not reacting like a bully. I will not accept abuse as an acceptable reaction to unconventional behaviour. We've had to struggle a lot with our kids' behaviour. Alex can be aggressive when frustrated and I take steps to protect the public from him. But I am his mother and I will protect him to the ground from anyone looking to hurt him. The letter saddens me as an example of a reality I wish was not true. Like Delenn from Babylon 5, I would like to believe we can all aspire to be better, be more than we are. And to be fair, the vast majority of people are compassionate and understanding if given the chance. It is a rare individual who is not and one bad apple shouldn't spoil the barrel. But it does make me think twice before reaching in. Those who follow me know that I have been painstakingly (if somewhat half-heartedly) restoring my dollhouse from when I was a child. This weekend I decided to stop procrastinating and tackle a bit which was holding me back: reassembling the octagonal roof from the tower. Reshingling all of the roof sections wasn't difficult. Time consuming but not difficult. Figuring out how to glue them all together into the proper orientation ... that was difficult. I couldn't figure out how to do it. There's an octagonal inset which forms the interior base but getting all those individual pieces to balance together was more than I could figure out. Since brooding wasn't getting me anywhere, I decided to bite the bullet and just give it a try. Maybe this would be one of those tasks which seem really intimidating at first but then turns out to be easy. For﻿ the record: it wasn't. I tried holding a piece in place at the proper angle until the wood glue dried (over an hour) but as soon as I removed the support, the glue cracked and the pieces fell apart. I tried balancing two and four pieces together at the apex, gluing popsicle sticks inside to act as a brace. Same problem. I tried using duct tape to tape all the segments together and then glue them to the base. Apparently wood glue and particle board are the two things which duct tape will not stick to. Finally, I tried using the paper join covers. I glued all the segments together, let them dry and then tried to wrap the whole thing around the inset. It didn't fit. This is the point where I indulged in some mental profanity. I tried wrapping it again, trying different orientations and eventually, I found the right fit. Then I had to hold it in place until the glue dried enough to keep it from splitting apart. You may think your friends are pretty good since they helped clean your bathroom or donated a kidney or something. But it's an empirical fact, my friends are the best friends in the world. A few weeks ago, I posted about my ongoing quest to find someone to help me with the boys after school. Alex gets dropped off at the exact same time that Nathan needs to be picked up. We had a gathering last weekend and one of my friends told me that he had a solution for me. At first I was skeptical since most of my friends live on the other side of town from me (making their local teenager recommendations a commuting pain). But he said he'd mentioned my situation to his mom and she was willing to volunteer to help out. I was flabbergasted with gratitude. A woman whom I've only met a few times is willing to inconvenience herself to help me out because that's what our group does. We've known each other for over twenty years now and we've seen the good, the bad and the ugly sides of all of us. And we still hang together and go the extra mile to help each other out. When Dave had cancer and was going stir-crazy trapped at home, our friends set up a rotating visitation schedule to keep him entertained. I feel very privileged to know such a wonderful, caring group of people. And I know I couldn't manage my life without them. No Sensory Friendly Planes or Turbo? There were a lot of children's movies released this summer. We had Despicable Me 2, Smurfs 2, Planes, Turbo and Monsters University. Some good, some bad ... some both. We had the opportunity to see three of them as a sensory friendly offering (DM2, MU and Smurfs 2). We skipped Smurfs, having learned to leave our childhood memories dimly glowing at the end of Nostalgia Lane. I'm grateful for the opportunity to see some of the kids' films this summer and I recognize that the sensory friendly films are probably a loss for the theatres with the increased staff costs and low turnout. But I'm still disappointed not to have the full complement of offerings. Me: Who wants ice cream after dinner? Nathan: I want to play Wii. Me: You could play Wii after ice cream. Nathan: No, I don't want ice cream. I'm feeling quite proud of this although slightly disappointed since I wanted ice cream and neither Dave nor Nathan seemed to share my desire. But hey, healthy living and choices are good things and I won't push him to eat frozen dairy products. It's a science-y kind of week for autism. Must be a slow news week, or maybe pre-September is the equivalent of sweeps for academic research. A study at Duke University has looked at over 600 000 births in North Carolina and found a correlation between inducing labour and autism diagnosis. Now before anyone gets too excited, correlation does not mean cause. One might be a cause of the other or they might both be caused by something else. Of the 600 000 births, over 170 000 had labour induced or hastened and 5 648 children developed autism. Not all were induced or hastened but 35 % of the total of autistic boys were the result of induced labour, compared with 29 % of the neurotypical boys. Not a huge percentage to hang a conclusion on but certainly worth examining further to see if families with genetic autism are more likely to have difficult births or pregnancies. Or to see if there is something else which might predict which children have both autism and a difficult womb-period. The study was done to see if a large scale study could replicate the results of some smaller studies which have found links with high-risk pregnancies and autism. The lead author, Simon Gregory, was very clear that he didn't think this study should discourage doctors from inducing labour since this is often a life-saving technique for both mother and infant. For myself, one of my pregnancies ended in an emergency C-section while the other proceeded fairly well. I had high blood pressure for both which made me "high risk" but both of my children were indisputably healthy after birth. If the correlation holds true, then pediatricians should be monitoring induced children for a higher risk of autism. Of course, that still leaves 65 % of cases without a such a correlation to explain but anything which can help us catch the diagnosis earlier is a good thing in my book. Dave has been kindly making digital copies of some of my family's home movies from when I was a kid. It's a long process involving a lot of computer time, which has been making blogging a little challenging since I can't log into the computer while it's processing. Family movies are one of those things that every family has but are rarely pulled out (unless someone is doing a biography special). I'll have to decide whether I want to sit down and watch them with the boys. They might be interested in seeing Mommy as a little girl. Or they might be more interested in watching cars crash into trains. Hard to tell. But I'm glad we'll have the copies, even though the quality of picture and sound both leave a lot to be desired. It's a little piece of my past. And I haven't given up on the hope of one day needing them for my own biographical special on TV when I become a rich and famous author. Hey, it's important to be prepared. I've been reading Bruce Hood's The Self Illusion: How the Social Brain Creates Identity and in one of the sections, he mentioned two really interesting theories for a genetic basis for autism. The first involves brain imaging studies looking the frontoinsular (FI) and anterior cingulate cortex (ACC) which are activated by social interaction. Scans show that these two areas operate differently in people with autism than they do in neurotypical individuals. Okay, time for a brief psychology lesson from an admitted non-expert. Neurotypical people will mirror those around them as part of social interaction. People unconsciously mimic poses, facial expressions and movements. This is part of how we are able to intuit how other people around us are thinking. By mimicking them, we trigger similar emotions in ourselves and thus can guess what they're feeling and experiencing. People with autism often don't mirror those around them. The FI and the ACC are both involved in the mirroring process. The ACC is "like an 'alarm center' that monitors goals and conflicts, including social interactions. If these interactions do not go according to plan, if people start to get the wrong idea out to us, we get anxious." Since people with autism are rarely able to predict social interactions, the alarms go off frequently, making social interactions even more difficult and unpleasant. There is debate about whether the differences in brain activities are the result of a lack of observation (people with autism often find it uncomfortable or overwhelming to look at faces, cutting out a lot of the non verbal cues available to help them interpret and predict other people's reactions) or if this is a cause for the lack of mirroring ability found in a lot of people with autism. Mirroring is one of those vital early childhood development tools which help babies and toddlers learn to be part of the human social environment. Children who are isolated during these critical phases either learn to mirror something inhuman (if exposed to animals) or simply never learn to fit in with any level of comfort. I know this is one of the things which Nathan's therapist focused on very early on, getting him to pay attention to her and mimic what she did. The second theory is from a neuroscientist, John Allman, who suggested that "the social deficit in autism may be based on a lack of a special class of spindle neurons called Von Economo neurons (VENs)." These neurons have highly connective fibres and branch out to different brain regions that are activated by social learning. They are found in social species like whales, elephants and apes. Humans have a lot of VENs in our FI and ACC regions and are thought to keep track of social experiences, which would let us build up a catalogue of possibilities and help us to predict future experiences. The density of VENs increases from infancy to age four, when they reach adult density. This matches the window for effective early intervention for autism, giving a potential biological explanation for why treating autism early can help to greatly minimize adult symptoms. Again, there is a chicken and egg debate about this. Does a lack of VENs make it harder for children with autism to store and explore social experience or does a lack of observation fail to stimulate VENs growth? Either way, it still suggests possible treatment directions. With my family's experience, I am a firm believer that there is a genetic component to autism. (Personally, I think we'll discover that several different conditions produce the same autism effect, but that's a separate blog.) My husband is on the spectrum, my children are on the spectrum and we have reason to believe there's even more autism on the family tree, going far back beyond modern parenting and environmental toxins. Tomorrow registration opens for the city of Ottawa fall and winter programs for next year. I've done my bit of poring over the catalogue and picking out programs for Nathan. That part was relatively easy. What was not so easy was finding programs for Alex. The city offers both regular and special needs programs. Alex doesn't have the social awareness to fit in with the regular programs. But the majority of kids in the special needs programs have physical challenges, which means the programs themselves are not well suited to Alex. This became especially obvious last year when we signed him up for gymnastics. It seemed like a good choice. Alex loves to climb and jump and move around. His ability to balance himself rivals Angelina Jolie's in Mr. and Mrs. Smith and is probably as good as most Cirque performers. But here is the problem. The regular class was held in a large gym with eight classes happening simultaneously. Too much stimulation and distraction for Alex. Okay, moving on to the special needs class. Where they were trying to coax the children to jump onto a platform a half-inch taller than the floor. My kid is ready for the uneven parallel bars and you think he won't be bored out of his mind having to jump onto a platform that barely registers as a change in elevation? My father offered to serve as a personal coach for Alex, basically just using the equipment while everyone else was there. But the city worried about being sued, no matter how much paperwork I offered to sign. And so it just never worked out. I wish the city offered two separate classes for special needs children. One for children with physical challenges and one for kids who have social or sensory issues. It's frustrating to see Alex tumbling right between the cracks and left with nothing. We do things independently with Alex but he really needs the benefit of interacting with people other than his parents and grandparents. He needs to learn that other people have useful information to pass on and can be interesting. Not to mention that there's a limit of how much we can expose him to, simply because we don't have access to equipment or necessary experience. He'll have activities through the fall, but they'll be solo, one on one efforts with his tutor and with us. Not ideal, but it's the best we have to offer right now. For the last few weeks, I've been painting our upper hall and stairwell. Generally, I've been doing a few hours here and a few hours there but I took advantage of having an empty house and ended up painting for almost 12 hours yesterday. And I am feeling it today. I'm fairly pleased with the results. Especially the boys' doors. I went with a little decorational whimsy. Alex loves stop signs. He has ever since he was a toddler. And he also loves OC Transpo. I've had a lot of practice freehanding stop signs but this is my first shot at a bus. I think it turned out fairly well. I had some pictures from the Internet and taped them to the door while I was drawing. It may be hard to read in the picture, but the bus is the 93 BEDTIME. Nathan has been spending some time with his grandparents this week. While he was there, they decided to have dinner in the backyard. My father was busy setting up the table but they still had to get the chairs down. Nathan wanted to be helpful so he insisted that he would catch the chairs (or rather, grab onto them and then my mother could let go). The chairs are a light plastic, the drop was negligible, it kept him out of mischief and let him be helpful. Win-win all around. Except when Nathan overbalanced with the second chair and fell to the ground. Immediately, both of my parents rushed to his aid to make sure he wasn't hurt. He was lying on the ground with the chair half on top of him. He looked up at them and said: "Little help here?" I picked up a book which has been on my shelf for over a decade: Worried All The Time: Overparenting in an Age of Anxiety and How to Stop It by Dr. David Anderegg. It's a useful book, counteracting the culture of fear which the media and Internet thrive on. He explores the common fears of parents: that their children will be hurt or assaulted, that the decisions parents make as their children are toddlers will decide their child's future as an adult and that the world is more competitive and more dangerous than it used to be. He points out the flawed logic behind each of these concepts and offers the common sense reassurance that parents can relax, children and fate are both more resilient than we would like to be believe. However, I find myself in a very different frame of mind than when I first read it (before I was even pregnant). I didn't want to be an anxious parent. I wanted to teach my kids that the world is forgiving, with a short attention span. So they don't have to be perfect. Mistakes are acceptable. The question I found myself asking was this: are my fears justified? This is the first generation of high levels of diagnosis for autism. Even 10 years ago, it was much more rare than it is today. We simply don't know what the prognoses are for all of these kids across the spectrum. We're still learning what can be effective treatments at certain developmental points. There's a lot of judgment, fear and shame across the Internet when it comes to parents whose children have autism. How dare you not try treatment X? How dare you care about expense when your child's health is at risk? Don't you know that the window of opportunity is slamming shut? Don't think! Do it now, now, now, now, NOW! Effort is still important but maybe we should cut ourselves a little slack for being pioneers in a still unknown world. We won't always make the right decisions but that doesn't mean we failed. We only fail if we give up trying. We are often more gentle with friends and strangers than we are with ourselves. So today, I'm going to take a little time to look in the mirror and see myself as a stranger. Someone who deserves credit for effort and perseverance. Why The Pressure To See Movies Opening Night? My aide asked me this question and made me feel old. You see, children, we geeks used to go to opening night not for the prestige or because we were afraid of spoilers but because of the film. By which I mean the actual physical roll of film which the studio shipped to the movie theatre in order for the theatre to show the movie. An actual canister of actual film, about the size of a large pizza box. Usually two per feature film. Now, this is where you children will need to use your imaginations. The film was strips of celluloid run through a projector. Each time the film was run, tiny specks of dust and hair would get stuck to the celluloid. Sometimes the celluloid would rip and have to be repaired. And sometimes you got a moron who didn't notice the film had jammed and it burned away under the heat of the incandescent bulb (because we also didn't have LEDs yet). Mostly though, the film just got dirtier and dirtier with each showing. Specks and blobs would flash up on screen, sometimes distracting us from crucial special effects or witty dialogue. So we went to opening night, to the first showing, because that was the cleanest showing of the film. The closest to the director/writer/producer's vision. With digital downloads to the theatres, this is no longer a real issue. Now go forth and play with your pocket computers while I try to decide whether or not to yell at the kids to get off my grass. Anyone who knows me knows that I am a Wolverine fangirl. Love the character, love Hugh Jackman. So I have been excited about this movie coming out for years. I really enjoyed Wolverine: Origins and initially thought this movie would be set between Origins and X-men. I was wrong. The movie is actually set after X3: The Last Stand, which is a horrible, horrible movie that I have done my best to erase from my memory. However, now it is necessary for continuity. Dang it. But leaving aside those foul dregs, The Wolverine is the story of Logan's time in Japan and his love affair with Mariko, one of my favourite Chris Claremont Wolverine storylines. In the comics, this is originally set right after World War II, but it works well for being updated timewise. There's been a lot of Internet praise about having filmed the movie in Japan and using Japanese actors and even .... <pause for dramatic effect> ... subtitles! Because people in a foreign country will usually use their own language rather than speak in English so the unseen audience can understand. I'll add my kudos to the theirs, aside from having everyone dress in black for the funeral (white is the cultural colour of mourning in Asia), the realism added substance and made a great symbol for Wolverine being increasingly out of his depth. The movie opens in the Yukon. Wolverine has gone to ground (as he so often does ... it's almost a cliché for his stories to start this way) and for a guy with adamantium blades in his arms, he has apparently forgotten how to cut his hair or shave. Not that I'm complaining. 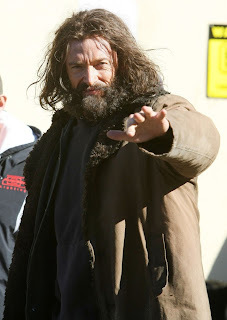 For some reason, the mountain man look works for me. But soon enough, he's back to his original trademark pointy locks. Take a moment to enjoy. Mr. Jackman worked hard for that physique and we should all take time to be properly appreciative. I was expecting Mariko to die before the credits. That's what happens in the comics and I thought they were foreshadowing her death when Logan had to mercifully kill the poisoned grizzly (who neither looked nor moved like a grizzly ... bad animators!). But she survives, giving her the longest lifespan of one of Wolverine's girlfriends yet (they usually have a shorter shelf life than discount milk). I only have a few complaints about the movie and most of them are pretty minor (the bear, the funeral clothes and the Gandalf/Balrog reenactment during the final fight). Overall, I thought they did a good job bringing it to life. I've seen it twice so far and will likely see many more times in future. Probably not in theatre because I can't afford it but that DVD is mine once it's out. Now, I'll admit, it would have to have been a pretty crappy movie before I would have disliked it. 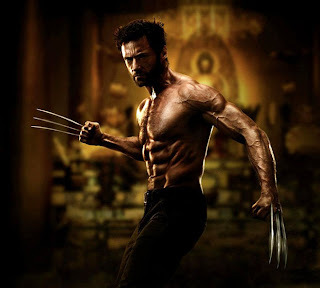 Aside from my fandom, Hugh Jackman spends an impressive amount of the movie shirtless, which is never a bad thing. I enjoyed it. I'd recommend it to others. I'll force other people to see it. He hasn't had a quote for awhile so everyone gets to enjoy him twice this week. Dave was making his usual growly morning sounds and Nathan was very carefully copying every move and gesture. Dave: Are you making fun of me? Dave: Just you wait, someday, you'll have a little boy making fun of you. Me: Or a little girl. Mommy would like a little girl. You can do that, right? Nathan: (pauses) I think I want a little boy. Me: A little boy and a little girl. Nathan: No, I want two little boys. Me: Two little boys and a little girl. Nathan: (rolls his eyes) Mommy, that's too many. I'd be tired. Alex has been able to swim for quite awhile but his ability to follow instructions has been less than exemplary. So he hasn't been able to pass the swim test which would allow him to not wear the wrist band which tells the lifeguards that he needs an adult with him at all times. We went to the pool and lucked out that we were the first ones there after it opened from the dinner break. Since it was quiet and we'd been practicing the steps of the test, I asked the lifeguard to try the test with him. He passed easily. So now he doesn't have to have an adult right with him (although I suspect we still will simply to avoid unpleasant interactions with other swimmers). One of the defining features of autism is the inability to pick up or read social cues. This is something I've always had something of a challenge with. I'm a practically-minded person and so I don't always see the point of some of society's conventions. I can pick up that something is not approved but judging the scale can sometimes be tricky. Especially with minor infractions. The boys have been doing therapeutic riding lessons once a week at a local farm. It's a lovely spot and they've been enjoying themselves. There's no seating near the paddock where the lessons take place, so after the first lesson, I decided to pack a lawn chair. I bring it along and once the kids are up on their respective horses, I set it up in the shade from a nearby barn and sit to watch the lesson. At first, I felt rather clever about the whole situation but as the weeks rolled on, I noticed that none of the other parents or caregivers have brought chairs. In fact, it's rare that anyone else is watching the lesson. They're in their cars or chatting to themselves at picnic tables which are out of sight of the paddock. I want to watch the boys enjoying themselves. I think it's important to watch the lesson so that I can reinforce anything they're having trouble with through the week. I don't want to stand around in the hot sun for forty-five minutes. I'd rather sit in the shade. Perhaps I've goofed. Perhaps I'm being overly sensitive. That's the point: I don't know. And it gives me sympathy for my kids and everyone else who has to experience this constantly. They have to know it's a real and frequent possibility that they've overstepped a social boundary without realizing it. But they can't be sure. It's uncomfortable to be constantly second guessing my own reactions and instincts. I'm still going to bring a chair and watch until someone tells me otherwise. The fine line between trailblazer and social idiot is hard to spot, but I'll just pretend I'm on the former's side.